The personality test Skill View® test is a variant of the Five Factor Model, NEO P.I. R., by Costa and McCrae. The test is valid and reliable and is used in companies for selection, assessment and development. 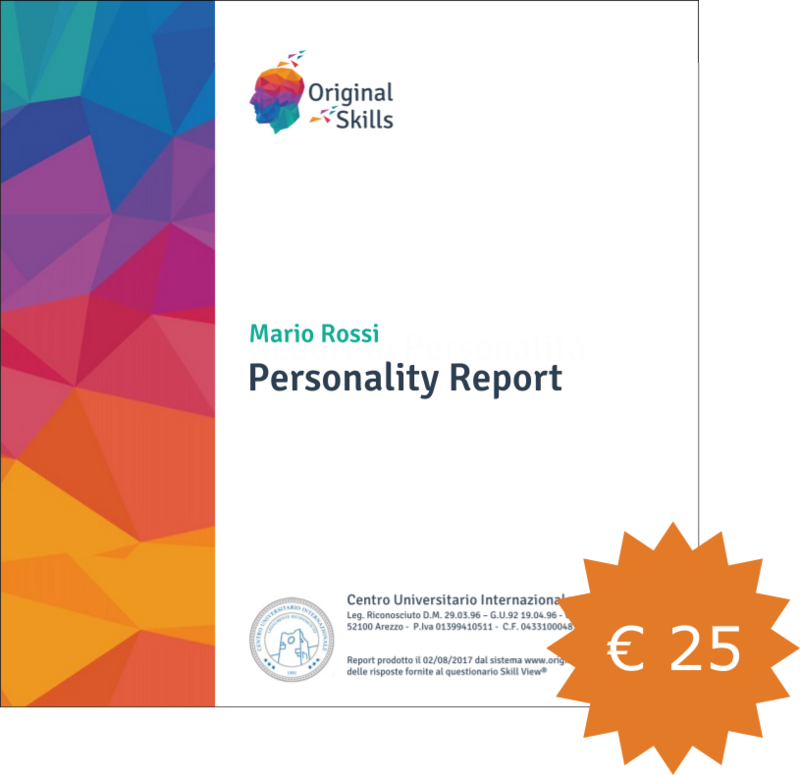 The “private” version of the test, made up of 120 items, provides an accurate description of the personality for individuals, in a free, non-working context. The personality test was made in accordance with current scientific theories and psychometric calculations, according to the standards of the American Psychological Association. The test is always updated both with the results of psychological research and those provided by cognitive neuroscience and genetics of human behavior. After you have completed the test, you will get a complete description of your personal profile. You will also obtain a certificate with a full personal profile certified by the International University Centre and useful tips to improve your true nature. Answer assigning the score in a scale of 1 to 5, according to which the phrase describes so very inaccurate or very accurate your behavior. Answers sincerely and based on how you are every day (and not as you would like to be). The compilation time is about 10-12 minutes. Congratulations, we were all surprised by how effectively you guessed what we are! It solved a doubt I had, and I was able to clarify simply; surely I will work on my self-esteem. Yes! For me it was definitely interesting, beautiful. I have reflected on what you told me.